With Big G over in Cape town for a while, South African wine has become prominent in my selection. 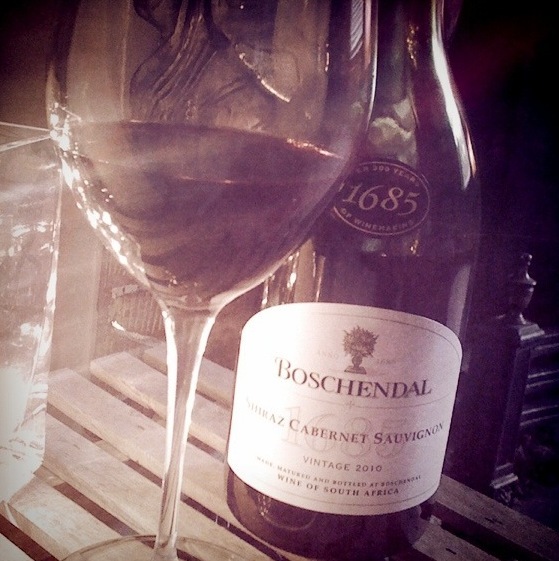 I came home from work one day to a meal and a bottle of this beautiful soft rich red from the Boschendal vineyard in South Africa. It’s become my new favourite, in place of Campo Viejo (sorry Rioja, I’ll be back!). The legend of Boschendal’s wines goes as far back as 1685. Only grapes from specially selected vineyards in the mountainous areas of the coastal region are used to make this rich blend of noble varietals. Made in the classic style and using French oak for maturation, the Boschendal Shiraz-Cabernet Sauvignon brings the best characteristics of the two varietals to the fore. The Cabernet Sauvignon’s meaty depth and firm tannins are offset by the Shiraz’s lingering spice and black fruit.